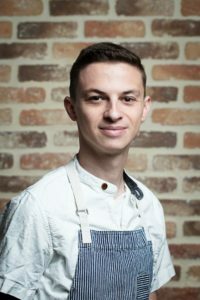 Chef Sasha Felikson thinks that borscht is going to be the next big thing in food. He speaks with such exuberance and passion that it’s impossible to disagree. Felikson is the executive chef at Doi Moi on 14th Street, Northwest. While the cuisine at Doi Moi is Asian inspired, Felikson is Ukrainian. He was born in 1987 in Kiev to Ukrainian Jewish parents. Felikson’s family left to escape religious persecution, with the support of the Jewish Federation. They lived for a short time in Italy, Boston and eventually settled in Rockville, Maryland. Felikson’s passion for cooking was stirred at an early age. In Kiev he lived in a crowded apartment with his parents, all four grandparents, an aunt and more. There was no money to go out, and there weren’t many restaurants, so cooking was a necessity. “Everyone in Communist Russia cooked,” he says.